LUXURY KNIT WIRE for the jewelry artisan in 14 beautiful colors. WireLuxe is metallic knit wire that is soft, flexible, lightweight and comfortable to wear -- yet sturdy and firm to hold its shape. 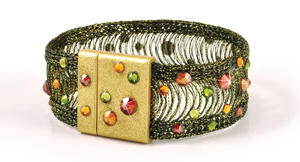 Jewelry artisans will love the elegant texture, rich colors, metallic shimmer and versatile structure. 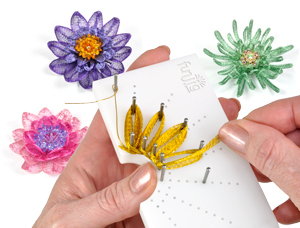 WireLuxe is beautiful used as it is or the perfect base to embellish. For a quick WireLuxe video click here. TO BUY WireLuxe click here. 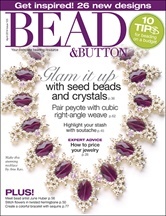 Combine 3 colors of 3mm WireLace, an Alacarte Simplicity magnetic clasp and a Swarovski BeCharmed big-hole bead to create a stunning bracelet that you can make in a jiffy! FREE Instructions, colorways, and buy supplies click here. 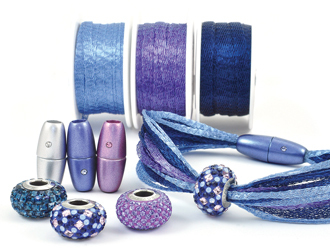 WireLace wire mesh ribbon for jewelry, crafts, textiles and embellishments. 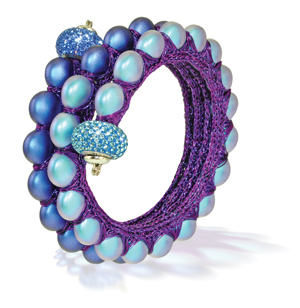 Made with fine wires and enamel coating to create a variety of stunning colors. Nickel-free, waterproof and heat-resistant - bake it in polymer clay! or go SHOP and use pull down menu. on the FunJig with WireLace. with SWAROVSKI crystals. You choose - we glue.